In 1887, at Rose Hill, in the southern part of the Town of Marcellus, N.Y., Frank B. 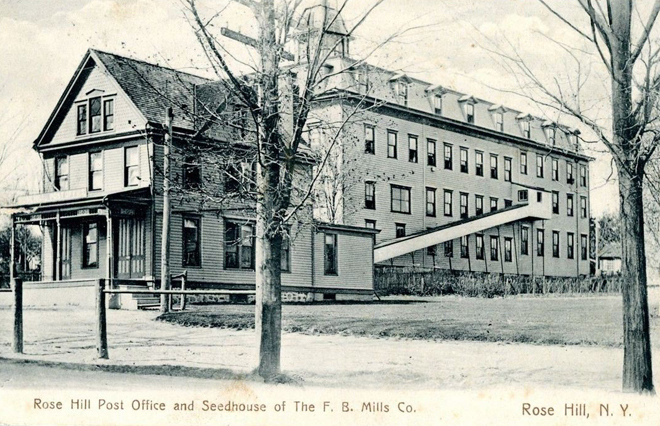 Mills began selling seeds, turning a boyhood fascination into a business. For his first catalog, he bought a hand press, set the type, and did the printing himself. He mailed out 3,000 copies and garnered 118 customers. By 1890, he was taking so many orders that Rose Hill needed its own post office. Frank B. Mills, conveniently, was named postmaster. In 1892, he was succeeded by his brother, William E. Mills. By 1895, the F.B. Mills Company had 400,000 customers, and by 1903, 800,000. 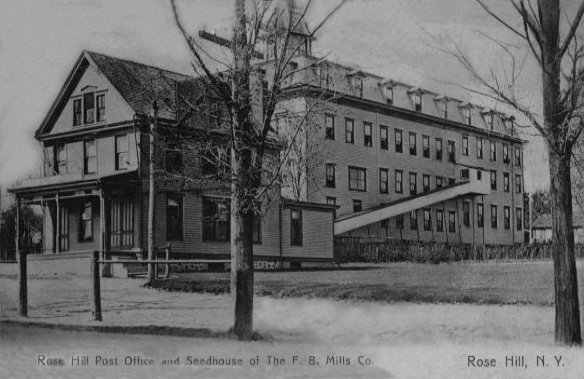 Catalogs and seeds were mailed all over the world from the little post office at the front of the warehouse. There’s a fuller history at saveseeds.org.